This month our featured business is Moments By Wayne. Wayne Gurnick has been involved in the wedding and events industry since 1985 and the way he has grown and adapted his business over the years makes his story a true tale of wedding entrepreneurship. Larisa, Waynes’s wife, joined the business in 2010 and is taking it in new directions including serving the growing DIY weddings market in a innovative way. I’ll hand over to Larisa to tell you more. 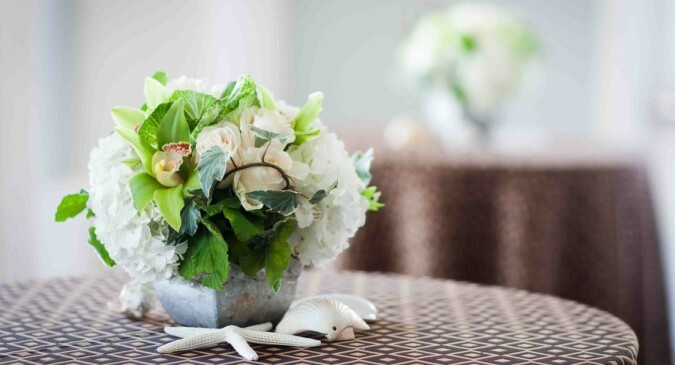 Moments by Wayne creates stylish and elegant weddings and celebrations in Southern California and across the US. Our services include “day of” coordination as well as complete concept, design, planning and coordination. For the DIY wedding clients, we offer The Ultimate Wedding Planning SystemTM – an innovative and cost effective way to plan your own wedding with help from the experts, including 24/7 wedding planning hotline and customized vendor referrals. What’s unique about our system is that it provides brides with direct access to a wedding planning expert over the phone, any time of day or night, so that can have the peace of mind that they are on the right track as they plan their own wedding. We are currently expanding our business to collaborate with hotels and other venues by providing The Ultimate Wedding Planning SystemTM to their clients. 2. Tell us a bit about the history of the business? Wayne started in the wedding industry in 1989 when he opened a boutique floral design studio, Floral Creations by Wayne. This successful, growing business attracted the attention of an investor with an interest in entering the floral design business, leading to the sale of Floral Creations by Wayne in 1997. Having designed events since 1985, Wayne identified a need for a knowledgeable and reliable source to ease the stress associated with the planning and production of trend-setting weddings and stylish events. The result: The launch of InOvations Event Production in 1998 with the mission to be the trusted source of information in order to simplify the wedding and event planning process. In doing so, clients could concentrate their efforts on more important things like the reason for their celebration and the joy that their family and friends bring them. Moments by Wayne is the latest evolution of Wayne’s brand. I joined the business in 2010, after concluding a successful corporate executive career. I’m now committed to expanding Moments by Wayne into a top-performing national event company. Recognizing an unmet need in the marketplace, I was instrumental in developing The Ultimate Wedding Planning SystemTM to help the Do It Yourself couples and to provide a valuable service to hotels and other venues producing large number of weddings. For as long as he can remember, Wayne has possessed a deep kinship with flowers. (And yes, people, too!) Beginning in high school, he was employed by an upscale florist that created arrangements for some of the who’s who in Hollywood. While it was paid employment, Wayne perceived it as an avenue for creativity and expression—something that to this day is a signature of the weddings he “arranges.” And even while flowers may be temporary, he believes floral design to be a true art form, and one that brings immense joy to others. My decision to join Moments by Wayne happened in the classic “aha” moment. I was considering different entrepreneurial opportunities for the next phase of my professional careersearching, looking for a venture that would fulfill my passion and was economically viable. That’s when it hit me – my passion for growing businesses and delivering exceptional customer service, together with Wayne’s depth of knowledge and experience in the wedding industry was the winning combination. 4. Why did you choose this particular business? Wayne chose the floral design business and ultimately the wedding planning business because of his great love for beautiful things, creativity and ability to relate to people. He is particularly passionate about creating temporary installations that exist for one day only and then become important moments in people’s memories. I chose this business because of the opportunity to create a completely innovative approach to the needs of brides and grooms. 5. Can you describe a typical working day? This is an interesting question. We have two types of typical days: event days, when we are on location pulling together months’ worth of work to create a once-in-a-lifetime day for our clients, and all the other days, spent on servicing our clients, building new relationships with vendors, marketing, educating and getting inspired. A typical event day, for an evening wedding starts surprisingly early, around 10 or 11 am. We are on location before the first vendor arrives for set up, providing instructions, making sure that our client’s vision is coming to life and resolving the inevitable challenges. We are still on location after the last guest leaves, making sure that all the gifts have been stored safely, that the facilities have been returned to their original condition and that all vendors have been paid. A typical non-event day is full of different types of activities. Always at the top of the list is responding to clients and prospects. Because of the plugged-in world that we operate in, we respond to calls, emails, blog posts, tweets, FB posts and even in person interactions within hours. That is one of the primary characteristics that sets us apart – nothing is more important that taking care of our clients. We reach out to other wedding professionals, reviewing work via the web, talking on the phone and meeting in person to determine their unique skills and capabilities. We often take field trips to new venues and stores, looking for inspiration in fashion, interior design, and nature – anywhere around us. Then, there is always the social media interactions that we value very much – writing blogs on topics of interest for our community, researching new ideas and showcasing trends. And at all times, on any day, we respond to calls that come in via the 24/7 wedding planning hotline that is an integral part of our Ultimate Wedding Planning SystemTM. These calls keep us vibrant and in touch with the needs of our brides. 6. What’s been your best moment so far? The best moments are always those when we get to see the pure joy on our clients’ faces because with our help they just had the time of their lives. Really, that’s what being a wedding and event planner is all about – seeing how our knowledge and expertise makes people’s dreams come true. The worst moments are those when we fail to impress upon a prospective client the importance of selecting the right vendors, whether that would be our company or any other vendor, all the while knowing that they are about to make a mistake. 8. Anything you wish you had known when you started? The importance of networking and marketing is critical to success in today’s wedding industry. 9. What’s your biggest challenge going forward? The biggest challenge going forward is to get heard. There is so much noise and misinformation out there, competing for the attention of brides and grooms. Our wedding planning approach and solutions are just what the mass-market couples need – cost effective and easy to use, and we are determined to grow aggressively so that we can continue to meet this need. 10. Do you have a top tip for someone starting out in the wedding business? Be sure that you’ve chosen this business because you love people and love to make them happy. Despite all the developments in technology, this is still a very personal, face-to-face business and to be successful in it you need to be inspired by your clients and love what you do. On the practical side, make sure to invest time and energy into marketing yourself and your business and figuring out how to be different than the competition. Have a sense of humor, too! New Wedding Trend or just a Fad?